A group of Texas dignitaries gathered at the intersection of Baker Lane and Frontage Road by the SH 550 toll road to unveil the first sign for Interstate 169 on February 16, 2016.6 When the entire toll road is completed, SH 550 will be resigned fully as IH 169. AASHTO approved the establishment of Interstate 169 at their May 15, 2015 meeting. 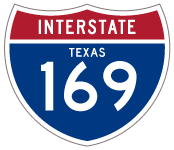 The U.S. Department of Transportation followed on November 5, 2015,5 and the Texas Transportation Commission approved 1.5 miles of IH 169 at their meeting on December 17, 2015. Managed by the Cameron County Regional Mobility Authority, SH 550 was developed to improve access to the Port of Brownsville and associated industrial areas to the east of Brownsville. The toll road replaced the former route of FM 551. The current east end of IH 169 is located at Old Alice Road in north Brownsville. The east end will eventually be at SH 44 and the Port of Brownsville main entrance. IH 169 ends at IH 69E & U.S. 77-83 on the north side of Brownsville. IH 69E runs south to central Brownsville and northwest to San Benito and Harlingen. “SH 550: A direct connection to international trade.” Brownsville Economic Development Council, December 17, 2013. “Big money transportation projects make gains in 2014.” The Herald (Brownsville, TX) January 2, 2015. “S.H. 550 ribbon-cutting crowd gets big I-69 news.” The Herald (Brownsville, TX) May 29, 2013. “PORT OF BROWNSVILLE – New State Highway 550 connector entry opens.” The Herald (Brownsville, TX) February 20, 2014. “SH 550 segment gets new name” The Herald (Brownsville, TX) November 9, 2015. “Portion of Cameron County highway gets new designation.” The Monitor (Brownsville, TX), February 16, 2016.